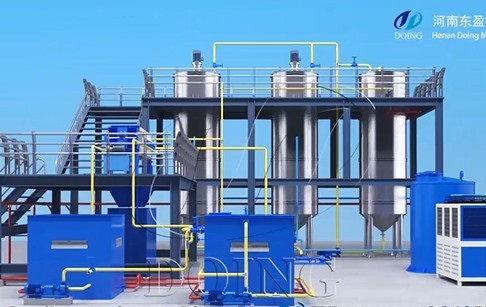 This video shows the working process of the 5-10tpd small scale palm oil fractionation plant, which is especially designed for small scale palm oil refinery plant by engineers of Henan Doing Company, based on the palm oil fractionation technology of large scale palm oil refinery plant. Same with large scale palm oil fractionation plant, 5-10tpd small scale palm oil fractionation plant have three working steps: Heating--Cooling and Crystallization--Filtering. 1. Heating: Heat the refined palm oil to break the original crystal in the refined palm oil. 2. Cooling and Crystallization: The water is cooled in cooling system and is provided for the whole sysetm. The water recycle system of DOING Brand 5-10tpd small scale palm oil fractionation plant is controlled by PLC. 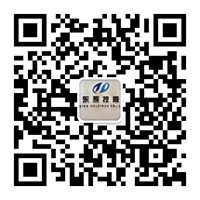 To control the temperature and water flow automatically. It can make the temperature drop slowly and the crystal grow slowly. 3. Filtering: When the crystal is mature, the palm oil is pumped into the filtration machine. 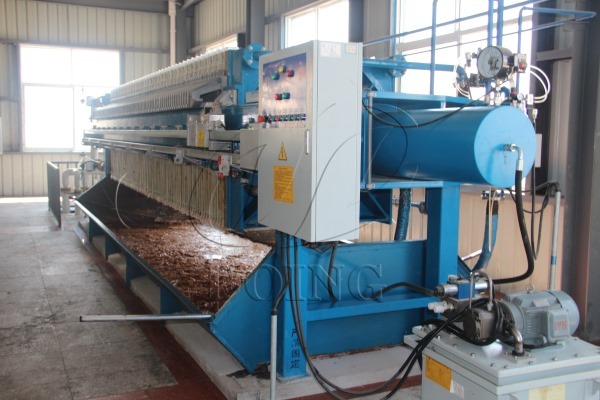 The filtration machine of DOING Brand 5-10tpd small scale palm oil fractionation plant uses membrane filtration machine. Crystallized RBD palm oil is conveyed to membrane filtration machine through a pump. Membrane filtration machine is composed of filter plate, membrane and space plate. Oil slurry gradually enters into the space through the filter plate piece by piece. Liquid fat flows out by the corrugated channel of rubber membrane through the filter fabric and then enters the soft fat tank by closed pipe outside the filters frame, solid fat is leftover. Finally unloading the palm stearin from the plates. 1. The stearin you get is able to make food product like shortening and margarine etc. And if the content of olein in stearin is low, the food will be more stable, and can storage longer time. 2. Some first grade palm oil has strict demand on the clarity, if the stearin is high in oil, the oil will be cloudy. Doing Company is a professional manufacturer of palm oil machine. The palm oil fractionation plant is usually working with a palm oil refinery plant. You can buy them separately or together. Our engineers can design for you according to your requirement. Besides, we can also provide palm oil processing plant(1-600tph). If you wanna to get more details about 5-10tpd small scale palm oil fractionation plant you can send E-mail to market@doinggroup.com. You can consult our professional engineer and specialized sales team with leave a message in below form.We will contact with you ASAP.You also can visit our factory in Henan,China.Get Detailed address.